President Trump Directs NASA: Send Astronauts Back to Moon and to Mars! 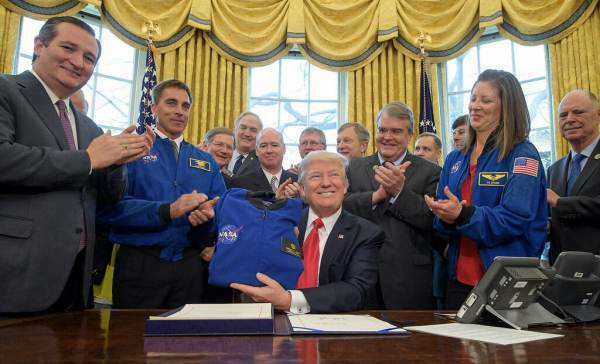 Bloomberg reports President Trump directed NASA to send American astronauts back to the moon and eventually even Mars! This is a giant step toward that inspiring future and toward reclaiming America’s proud destiny in space. And space has to do with so many other applications, including a military application. So we are the leader and we’re going to stay the leader and we’re going to increase it many fold. In September, Jim Bridenstine, a Republican from Oklahoma, was nominated by Trump to be the next NASA administrator. Bridenstine, once confirmed, would be the first elected official to head the agency – and is an advocate for bringing private companies, like Elon Musk’s SpaceX into NASA’s operations. The U.S. commercial space industry has invested hundreds of millions of dollars in private capital to develop innovative capabilities for lunar transport, operations and resource utilization. The administration should direct NASA to better use that private investment to achieve the goals of the directive. Bloomberg also points out that the government’s new space policy based on Trump’s order will also scrap the NASA program that would have sent humans to an asteroid. Truly, a bright and stunning future awaits in the stars; Americans are once again turning their head skyward and ready to accomplish milestones for humanity. And – as usual – it’s all thanks to President Trump!